Györgyi, Barnabás and I have really been kicking our running into high gear lately. Partly it’s just getting healthy for a good summer, but mostly it’s to drop a few pounds before we go to America where I plan on spending 30-85% of my time eating Galley Boys at Swensons and drinking Great Lakes lagers. And Mexican food. Oh sweet cilantro, I’ll see you soon darling. 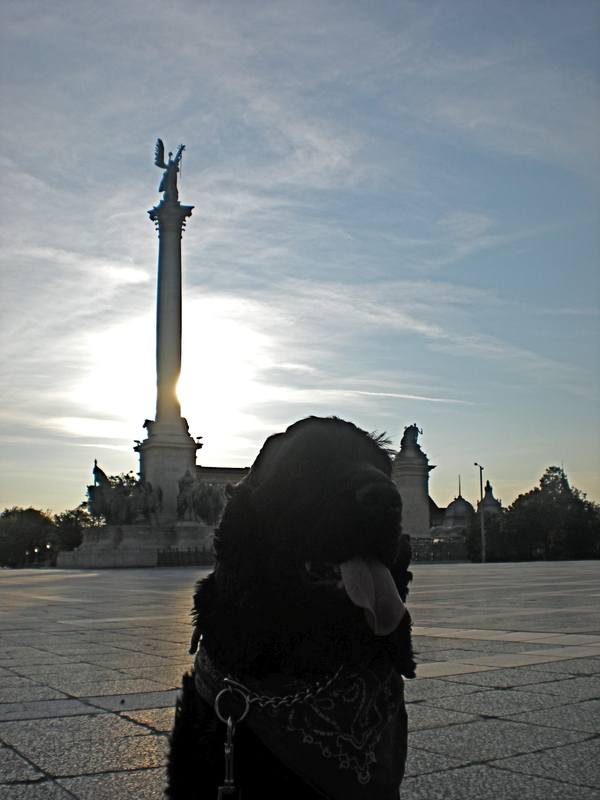 So on Saturday we were up at 5 for a nice long run to Hero’s Square (Hősök tere). I’ve been there several times now, but on Saturday morning the entire square was empty but for us. 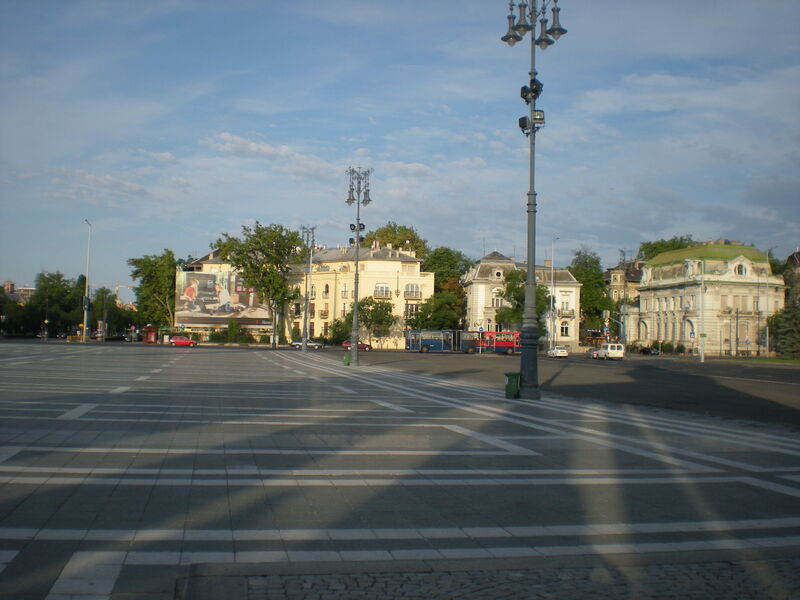 At the center of Hero’s Square is the Millennium Memorial. It’s called that because construction on it began in 1896 to celebrate the 1,000th anniversary of the founding of Hungary (though it wasn’t finished until 1929). 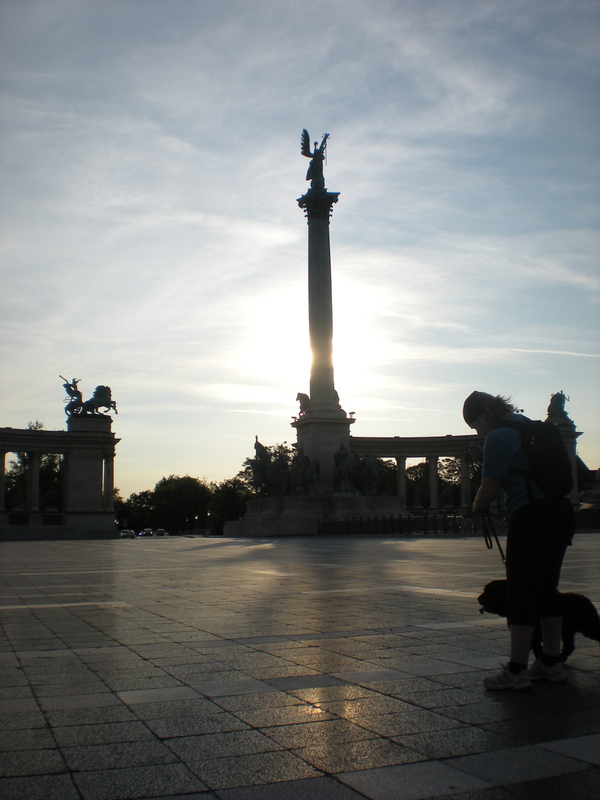 The monument has been central to cultural and political life of Hungary but probably one of the most significant events to take place there was in 1989 right after the fall of Communism. On June 16th of that year, over 250,000 people gathered for the reburial of Imre Nagy, who was executed in 1958 in Moscow for his deviance of the Soviets during the failed revolution of 1956. On top of the center is a statue of archangel Gabriel who holds in his right hand the crown of St. Steven, the first king of Hungary, and in his left hand the apostolic cross that the Pope gave to St. Steven for converting Hungary to Christianity. Hungarians are very proud of Steven for this, and he is definitely seen as a real Christian warrior. There’s even an incredibly popular Hungarian rock opera dedicated to Steven defeating the pagans. But despite what’s written in the books, King Steven was probably about as genuinely a Christian as Constantine. 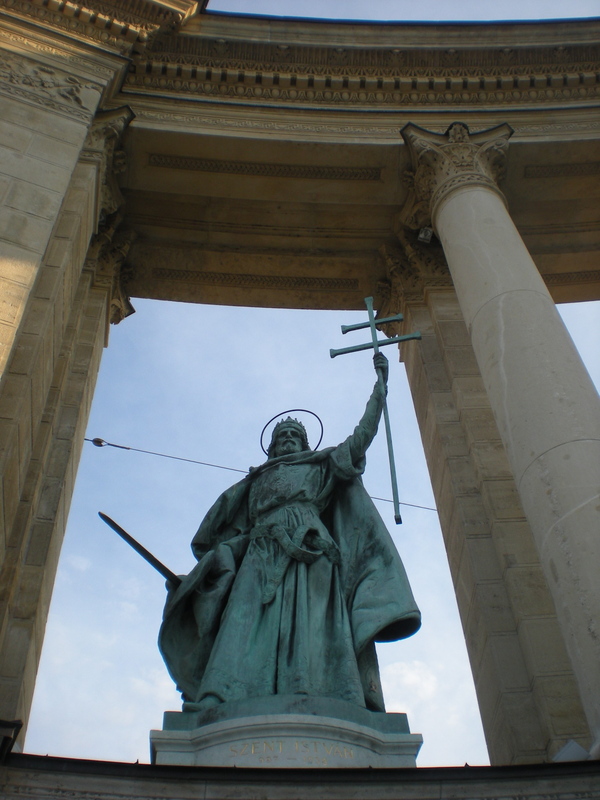 The seven Magyar chieftains who brought the Hungarian people to Hungary, through the mountains and into the Carpathain basin, also adorn the column base. In the very front is Árpád (Árpi, affectionately), who is known as the founder of the Magyar nation. The other chieftains are Előd, Ond, Huba, Töhötöm Kond, and Tas. 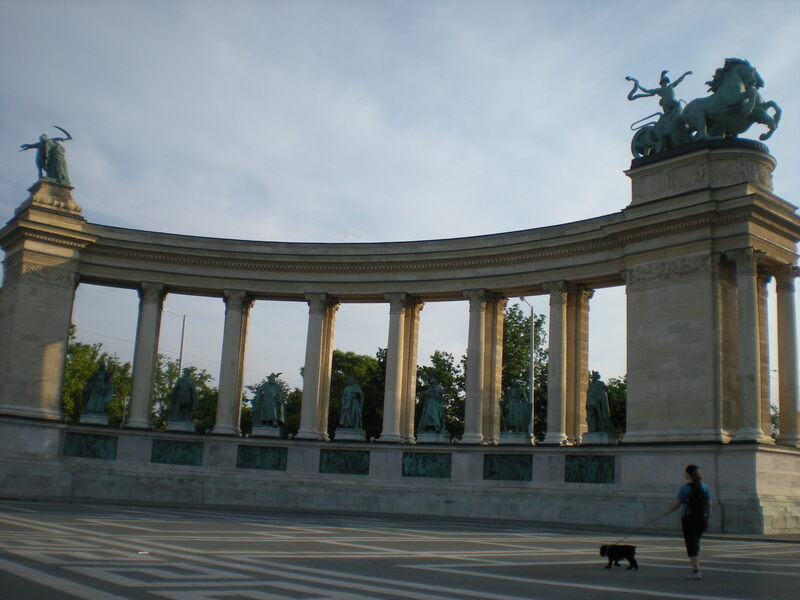 Finally, in the back of the monument, there are two colonnades that hold seven statutes each representing great Hungarians throughout history. Some notables (and the translation of their plaques) are: Stephen I of Hungary: St. Stephen receives the crown from an emissary of the Pope, Coloman of Hungary: Coloman prohibits the burning of witches (yay!) Béla (I adore this name) IV of Hungary: Béla rebuilds the country after the Mongol invasion, and Lajos Kossuth: Kossuth rallies the peasants of the Great Plain. Something interesting that I learned while doing research for this post is that when this part of the monument was being constructed, Hungary was still part of the Austrian Empire, so the last five of the statue spaces were alotted to important ruling Hapsburgs including Maria Theresa and Franz Joseph (husband of Queen Elisabeth—Sisi, the forever sweetheart of Hungary). Though since the statues were heavily damaged during WWII, during reconstruction the Hapsburgs were replaced by Hungarian figures. All in all, it was a beautiful morning and we were able to snap some pics of Barna without any people around. Probably most tourists won’t follow this advice, but if you want a stunning photograph of some of Budapest’s most famous monuments, especially when the sun lights them on fire and there are no people around to knock away your camera, no one hawking their trinkets or begging for money, nor busses honking around corners and expelling their exhaust into your lungs– start your day at 5:30 or 6am. Trust me, the pictures and peace will be worth it. And you can sleep when you go home.